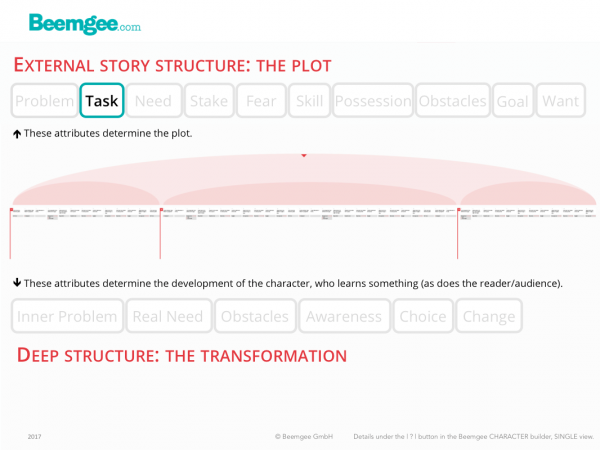 The protagonist is the main character or hero of the story. But “hero” is a word with adventurous connotations, so we’ll stick to the term protagonist to signify the main character around whom the story is built. 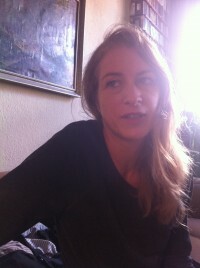 Sometimes it is not so easy to know which is your main character. Generally speaking, the protagonist is the character whom the reader or audience accompanies for the greater part of the narrative. So usually this character is the one with most screen or page time. 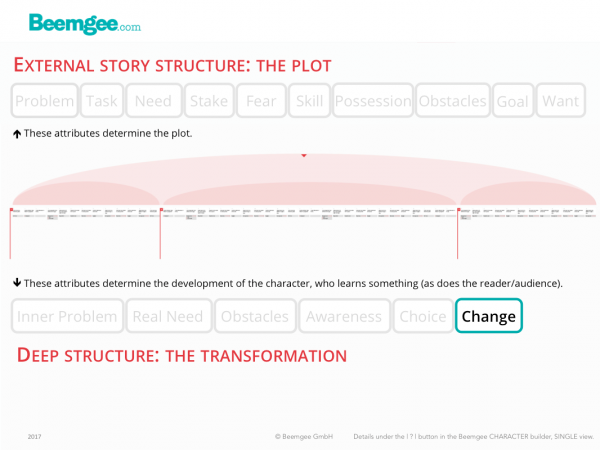 Often the protagonist is the character who exhibits the most profound change or transformation by the end of the story. 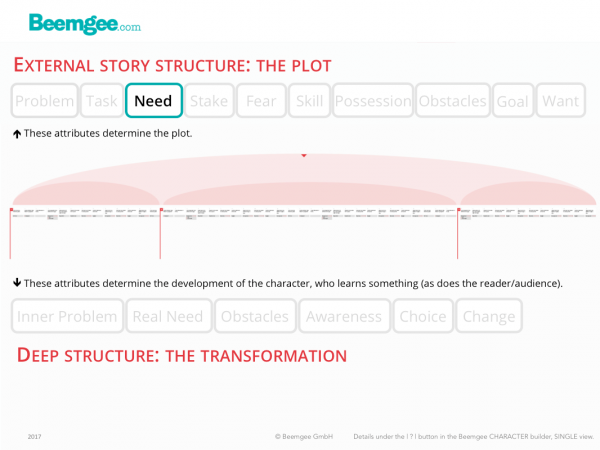 Furthermore, the protagonist – and in particular what the protagonist learns – embodies the story’s theme. For simplicity’s sake, let us say for the moment that in ensemble pieces with several main characters, each of them is the protagonist of his or her own story, or rather storyline. Since the protagonist is on the whole a pretty important figure in a story, there is a fair bit to say about this archetype, so this post is going to be quite long. Is the protagonist the most interesting character in the story? What are the most important aspects of the protagonist for the author to convey? What about the transformation or learning curve? How Interesting Must The Protagonist Be? Some say the protagonist should be the most interesting character in the story, and the one whose fate you care about most. But while that is often the case, it does not necessarily have to be true. You’re on a boat, and you see somebody fall into the water. Which of the following two cases would cause you to react with stronger emotion? Presumably your emotional reaction would be stronger if the child fell off the boat. Because you know that the child’s life is at stake. The first situation is not life-threatening, the only thing at stake is the dryness of the man’s clothes and his self-esteem. The degree you care about events that happen to people, and to yourself, is directly related to what’s at stake. This applies as much to fictional characters as in the real world. In a story, if the treasure hoard is what the character wants, then slaying the dragon is the goal. The goal is what the character thinks will lead to the want. Since the hoard has been there for ages, there must usually be some sort of trigger for the story to get started, i.e. for the character to want the hoard now, at the time the story begins. Often, an external problem creates such a trigger. It might supply a reason why the hero needs the hoard now, something more specific than just the general sense of wanting to be rich. Perhaps the hoard isn’t the reason at all. Perhaps there is a princess in distress, which certainly adds urgency to the matter. Either way, dealing with the dragon is the goal. So the old storytelling adage. What does that mean, exactly? 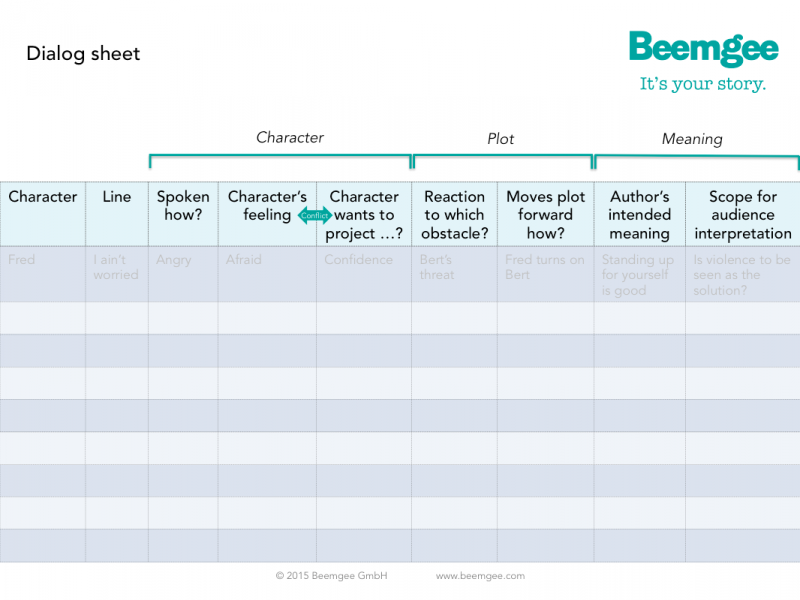 More or less explicitly, the main character of a story is likely to have some sort of task to complete. The task is generally the verb to the noun of the goal – rescue the princess, steal the diamond. 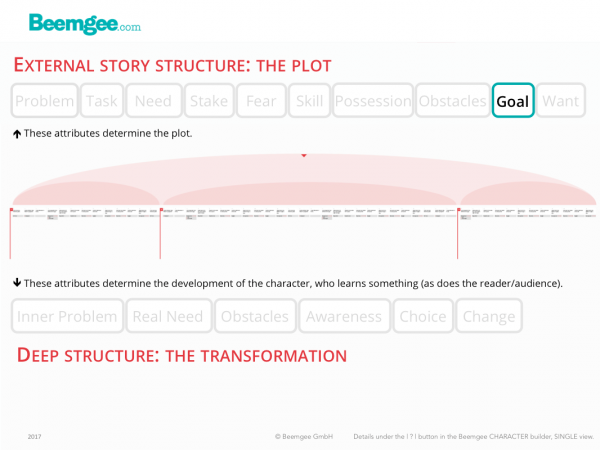 The character thinks that by achieving the goal, he or she will get what they want, which is typically a state free of a problem the character is posed at the beginning of the story. The action is what, specifically, the character does in order to achieve the goal: rescue the princess, steal the diamond. In many cases, this action takes place in a central scene. Central not only in importance, but central in the sense of being in the middle. In most stories, the protagonist has something to do. The task is the more or less explicitly defined mission a character sets out on in order to reach the goal and thereby solve the external problem. Many of the major characters in a story will have something to do, which may result in them getting in each other’s way. In a story, more or less everyone has a task. 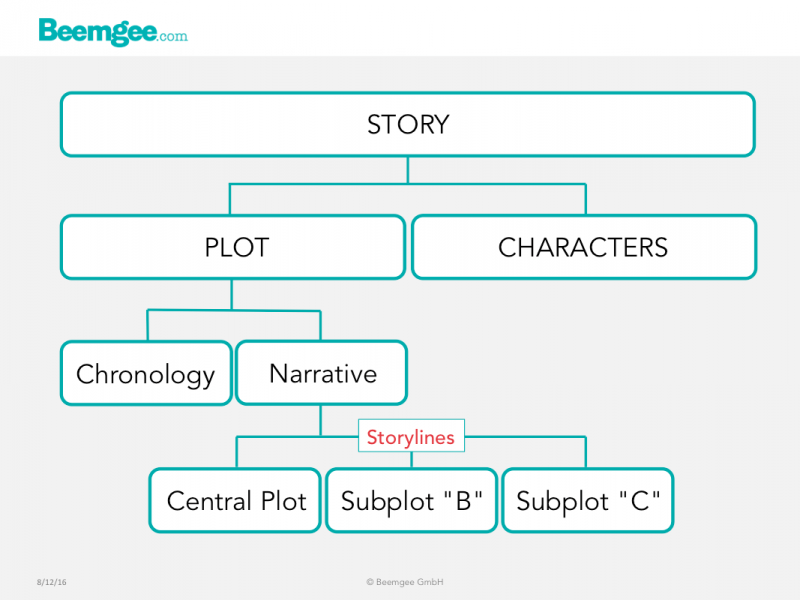 What characters do in a story defines them and determines their roles and narrative functions in the story. In this sense, it is an antagonist’s task to get in the way of the protagonist; an ally’s task is to help the protagonist; a mentor’s task is to advise the protagonist and set them on their way. But while all that is true, it isn’t really what we mean by task. If there is one thing that ALL stories have in common, it is change. A story, pretty much by definition, describes a change. Indeed, every single scene does. The most fundamental change that stories tend to describe is one of recognition of truth. What is not known at the beginning of the story is recognised and thus becomes known at the end. This is obvious in crime stories, but holds true for almost all other stories too. The story therefore amounts to an act of learning. Often the learning curve is observable in the protagonist, who tends to be wiser at the end than at the beginning. But the point is really that the recipient, the reader or viewer, is actually the one doing the learning – through experiencing the story. So within a story, what changes? A character with a goal needs to do something in order to reach it. The outward needs of a character – things she needs to acquire or achieve in order to reach the goal – divide the story journey into stages. In storytelling, characters usually know they have a problem and there is usually something they want. They tend to set themselves a goal which they believe will solve their problem and get them what they want. In order to get to the goal, the character will need something. Some examples: If the goal is a place, a means of transportation is necessary to get there. If we can’t rob the bank alone, we’ll have to persuade some allies to join our heist. If the goal is defeating a dragon, then some weapons would be helpful. If magic is needed, we’ll have to visit the magician to pick some up. While the perceived need might be an object or a person, it usually requires an action. We’ll need a car, so do we buy one or steal one? We’ll need a sword, so do we pull one out of a stone or go to the blacksmith? If we need help, who do we ask and how do we talk them into joining us? We’ll need magic, but how do we find a magician? Ask an elf or go to the oracle for advice? What’s the problem? Does the character know? 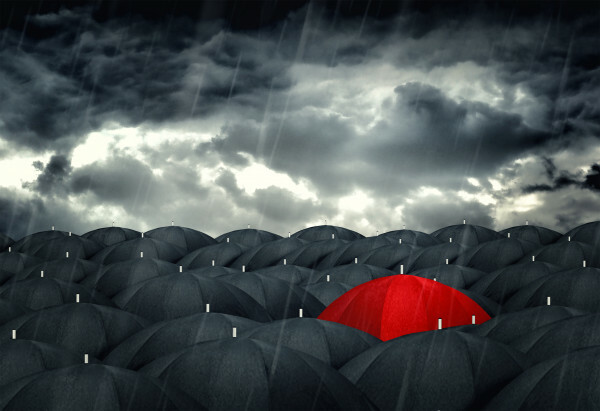 In storytelling, discrepancy between a character’s awareness and the awareness-levels of others is one of the most powerful devices an author can use. “Others” refers here not just to other characters, but to the narrator and – most significantly – to the audience/reader.